A warm, tangy salad that features all the sunshine flavours of the Mediterranean. 1. Mix together the harissa and 1 tablespoon of the olive oil and brush the chicken and peppers with the mixture. 2. Cook the chicken and peppers in a preheated griddle pan or under a medium grill for 8–10 minutes on each side until nicely browned and cooked through with no pink meat and the juices run clear. 3. Meanwhile, place the couscous in a large heatproof bowl and cover with 300ml boiling water. Leave for 5 minutes until the water has been absorbed, then fluff up with a fork. Stir through the remaining tablespoon of olive oil and transfer to a large serving bowl. 4. 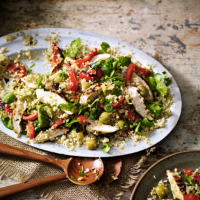 Slice the chicken and peppers into strips and add to the couscous along with the salad leaves, olives, lemons and coriander. Toss well together and serve immediately, or leave to cool completely and serve chilled. Vegetarians can try this lovely salad with slices of grilled halloumi in place of the chicken.